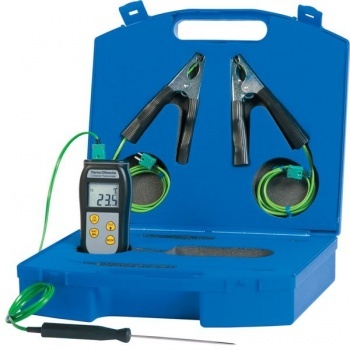 HVAC thermometer kit specifically designed for the heating & ventilation industry. It is supplied in a useful ABS carrying case with ETI Therma Differential thermometer, probes, and a FREE traceable certificate of calibration. This HVAC thermometer kit represents excellent value for money for heating, air-conditioning and ventilation engineers. Excellent product, originally purchased to sort a problem with the heating system ( wood stove) but the probe was a god send for the turkey, handiest bit of kit I have bought in a very long time.